‘This was always my dream, to create the best cellar door in the region’ says owner and winemaker Joe Grilli as Primo Estate was named McLaren Vale Cellar Door of the Year by the Cellar Door Committee of the McLaren Vale Grape Wine and Tourism Association. 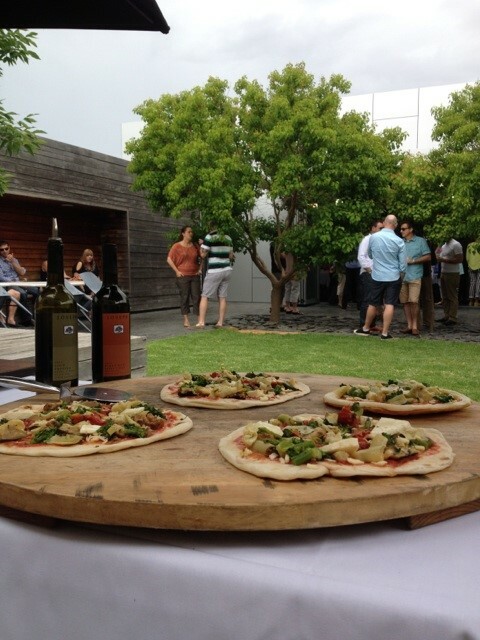 Joe’s dream started back in 1979 with the first vintage of Primo Estate but wasn’t fulfilled until 2006 when Joe and his late wife Dina finally opened their ultra modern cellar door, complete with tree shaded piazza and inbuilt wood oven, bringing a touch of modern Italian style to McLaren Vale. Inspired by their vintages in Europe the building combines Italian design with outstanding quality local materials, just as Joe aims to do with his wines and olive oils. 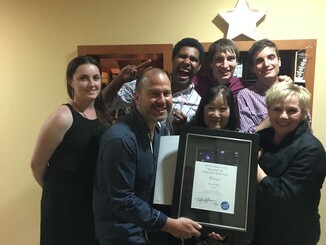 As Primo Estate’s cellar door prepares to celebrate its 10th anniversary in 2016, Joe’s vision and the hard work of his team have been recognized with the ultimate recognition from their peers, the McLaren Vale Cellar Door of the Year Award. ‘It’s all about sharing our passion for this amazing region and these great wines to make sure our visitors enjoy it as much as we do’ says cellar door assistant Jesse Kemelfield who was singled out to receive a Regional Star award for outstanding service. ‘It’s a true honour to win in a region that has so many amazing cellar doors, I like to think that it is our genuine love for what we do that allows us to give a memorable experience to our visitors’ says cellar door manager Mark Van Gestel. 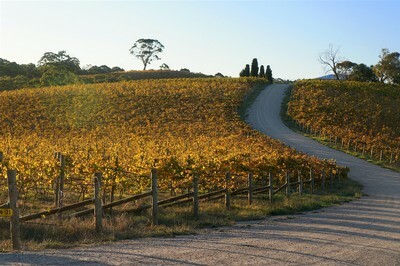 ‘Primo Estate delivers a true McLaren Vale experience with exemplary customer service and stylish wine tasting at their stunning cellar door – a very worthy recipient of the Cellar Door of the Year Award from Phil Hoffman Travel’ says Jennifer Lynch, General Manager of McLaren Vale Grape Wine and Tourism. Our cellar door is coming to Brisbane! We are bringing our full cellar door experience to the heart of Brisbane for two days at Black Pearl Epicure. Join cellar door manager Mark and Daniel and Elena from the new generation of the Grilli family for two days of wine tasting, special offers and la dolce vita, bringing McLaren Vale to your doorstep. Bring your friends along as we pour our full Primo Estate and Primo & Co ranges as well as offering our classic JOSEPH Experience tasting flight accompanied by a tasting platter of bread, cheese and JOSEPH Extra Virgin Olive Oil. Booking is advised for the JOSEPH Experience, to reserve your place email cellardoor@primoestate.com.au or call us on 08 8323 6800. Just as in McLaren Vale the JOSEPH Experience cover charge or $15 per head will be waived with any purchase from the JOSEPH range. Taste our wines, check out new vintages and say hello to the team; there will be some great value special offer dozens to order on the day. We can't wait to see you there! To book your JOSEPH Experience tasting please ring the Primo Team on 08 8323 6800 or email cellardoor@primoestate.com.au (please note that Black Pearl Epicure will not be taking cellar door bookings). 'This succulent young wine from close to Adelaide has passionfruit, sweet citrus and herbaceous aromas that surge through a light, ripe, tangy palate. A crowd pleasing style'. Heat JOSEPH Olive Oil in a large saucepan over medium heat. Add onion, carrot and celery. Cook until lightly coloured and softened. Add chicken pieces and brown slightly. Season to taste. Add the white wine and allow liquid to evaporate to half its orginial volume. Add tomato, cover and cook over a low heat until the meat is tender (about 45 minutes). This recipe can be adapted by adding mushrooms (fresh or dried) and also for a more intense flavour using red wine instead of white. Serve by itself or over boiled rice. Our cellar door is coming to Sydney! Following the huge success of last year's pop up cellar door we will once again be offering our full cellar door experience in Rosebery. Pop in for a tasting then stay for lunch, a great day out and a chance to stock up on some special offer wines. In addition the full range of Primo Estate and Primo & Co wines, cellar door manager Mark and third generation Grilli family members Matteo and Elena will be offering our classic JOSEPH Experience tasting flight accompanied by fresh bread, Italian cheese and JOSEPH Extra Virgin Olive Oil. Booking is advised for the JOSEPH Experience tasting; reserve your place by emailing us at cellardoor@primoestate.com.au or calling us on 08 8323 6800. The JOSEPH Experience cover charge of $15 per head will be waived with purchase from the JOSEPH range just as in McLaren Vale. In addition to your chance to taste the full Primo Estate range, check out new vintages and say hello to the team there will be some great value offers on special dozens of our wines. We can't wait to see you there. Please note the venue does not take advanced bookings for breakfast or lunch, just turn up on the day and grab a table. Our cellar door is coming to Melbourne! We are bringing our full cellar door experience to the heart of Melbourne for three days at iconic bar and gallery 1000£Bend. Pop in for a tasting and stay for lunch or a coffee at this fantastic relaxed venue. Join cellar door manager Mark and Matteo and Elena from the new generation of the Grilli family for three days of wine tasting, special offers and la dolce vita, bringing McLaren Vale to your doorstep. Taste our full range, check out new vintages and say hello to the team; there will be some great value special offer dozens to order on the day. We can't wait to see you there! Share a delicious long table lunch in the spring sunshine this October long weekend! Alcohol free 'Drivers tickets' for non-drinkers and children under 18 can be purchased for $70. No refunds less than 7 days prior to the event.